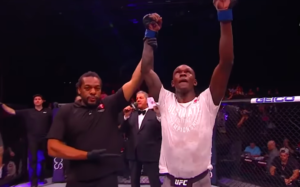 Derek Brunson and Israel Adesanya traded verbal shots at a press conference last week to promote the UFC’s upcoming schedule, and the latter believes it’s because he’s already in the head of the middleweight. “I think the guy is already scared, man,” Adesanya said. “You see how he carried himself on the stage? It’s funny, he didn’t have that same energy about 30 minutes ago at the hotel. He’s a certain kind of guy because the people around him want him to flex and sell the fight. He’s coming out with all this stuff like, ‘Oh you’re too skinny bro’, and I’m like, ‘Bro, this isn’t CrossFit’. Adesanya (14-0) has gone 3-0 thus far in the UFC and is coming off a decision win over Brad Tavares. Brunson (18-6), meanwhile, was KO’d by “Jacare” Souza in his last outing, which followed consecutive knockout victories over Lyoto Machida and Dan Kelly.